Victorywould elevate Buveur D’Air into the company of Hatton’s Grace, Sir Ken, Persian War, See You Then and Istabraq as a three-time winner of the Champion Hurdle. But what hadseemedrather likely after success over Samcro in December's Fighting Fifth Hurdle, where he earned a career-best Rating Post Rating, now feels very much in the balance. Market confidence was dented by a surprise short-head defeat to stablemate Verdana Blue in Kempton’s Christmas Hurdle, a first reverse since a third-placed finish to Altior in the Supreme Novices’ Hurdle at Cheltenham in 2016. 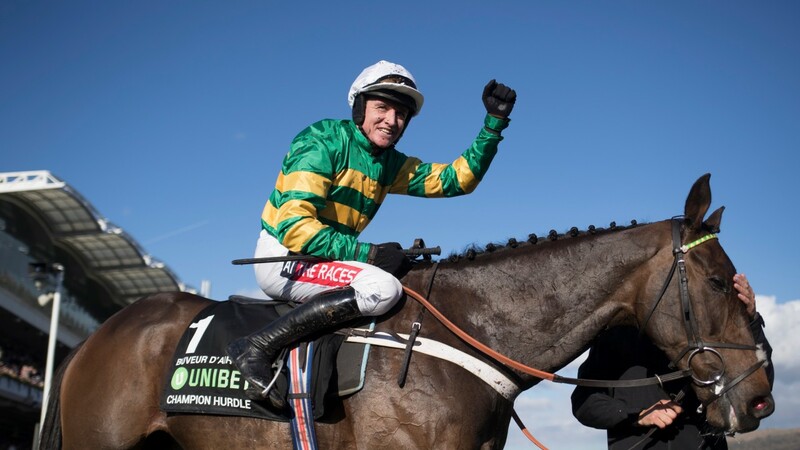 But it has been the sparkling form of Apple’s Jade and the decision to redirect her to the Champion Hurdle that has seen Barry Geraghty’s mount challenged, and in many places eclipsed, as favourite for the Unibet-backed contest in which he beat Melon by a neck last year. A comfortable win over subsequent Grade 2 scorer Vision Des Flos and the softening of the Cheltenham ground both rate as positives, however, as Nicky Henderson, who trained See You Then to his three successes in the 1980s, seeks an eighth win in the race. Henderson said: "Everything has gone smoothly with Buveur D'Air. His preparation at Sandown was great and while he got beaten by Verdana Blue at Kempton in the Christmas Hurdle, this is a completely different ball game to two miles around there on goodish ground. "You'd be a bit wild not to expect the places to be reversed. He's in very good form and I'm very happy with where he is– I'm confident he's coming in a better horse than he was last year." 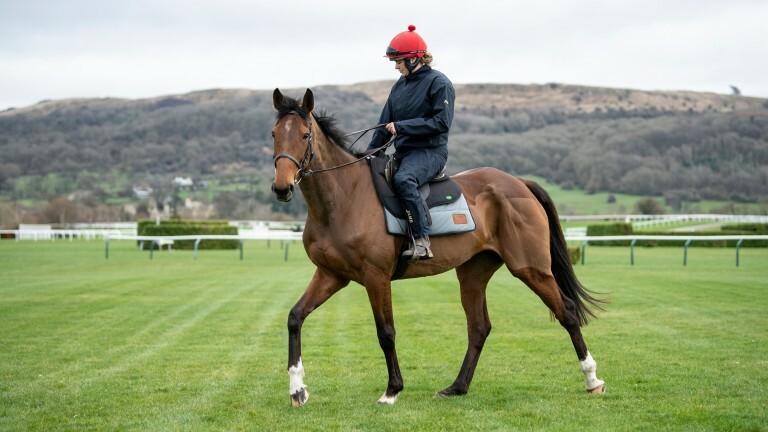 Verdana’s Blue’s victory over Buveur D’Air catapulted her into Champion Hurdle contention, but Henderson considers her dependent on the ground and her odds have lengthened as the rain has fallen at Cheltenham. Defeat to Gumball on the all-weather at Kempton a fortnight ago came at odds-on, but the booking of Davy Russell– who was last year’s leading jockey at the festival, where he has had a winner in each of the last 13 years– is certainly a positive. Nico de Boinville, aboard Verdana Blue in the Christmas Hurdle, is instead on Brain Power, who made a successful switch back from chasing when winning the International Hurdle at Cheltenham in December. Now eight, that was only his second start overhurdles since disappointing in Buveur D’Air’s first Champion Hurdle win two years ago. 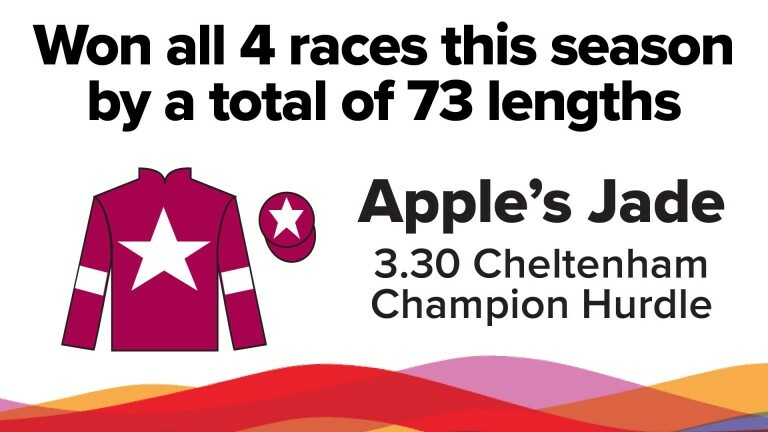 A staggering performance in the Irish Champion Hurdle last month changed everything about the festival target for Apple's Jade, with her 16-length win swinging connections away from a Mares’ Hurdle bid to take on Buveur D'Air. Apple’s Jade had an uncharacteristic off day when third in the Mares’ Hurdle at the festival last year, but she has landed three Grade 1s and a Grade 2 this season, bya cumulative winning distance of 73 lengths. Gordon Elliott, owners Gigginstown House Stud and jockey Jack Kennedy are all seeking a first win in the race, and the trainer said: "Apple's Jade is very well and travelled over fine. The ground and the trip should be fine and going for the Champion made an awful lot of sense after her performance at Leopardstown. "You have to respect Buveur D'Air, andLaurina is very good. But we're very happy with our mare. She's all set." Kennedy, who rode four winners at the festival last year, said: "Apple's Jade has been better than ever this season. She was brilliant at Leopardstown and I'm really looking forward to the race. "She's very straightforward and doesn't have to make the running, but we'll see how things go early on." The Willie Mullins-Ruby Walsh combination has yielded four Champion Hurdle victories and the pair are united in their high regard for Laurina, who now faces by far the biggest test of her career. Laurina is unbeaten in six starts for Mullins and was a runaway winner of the Grade 2 Mares' Novices' Hurdle at the festival a year ago. However, she has competed only once in a Grade 1 race, when landing a mares' only event at Fairyhouse last season. The six-year-old is two from two this season and beat a solitary rival a long way at Sandown before landing the Quevega Mares Hurdle at Punchestown last month. Mullins said: "Laurina is a very good mare and while this will be the biggest challenge she has faced so far, we're very happy with her. The soft ground will suit her well." Walsh, too, rates Laurina highlyand said: "It's impossible to know how good she might be. She's done nothing wrong and gives you a great feel, but this will be a completely different challenge to anything she's faced before." Sharjah, on whom Patrick Mullins will be attempting to become the first amateur to win the race since Colin Magnier on For Auction in 1982, has enjoyed a big season, winning the Galway Hurdle and two Grade 1 events, with Mullins partnering him to two of those wins. Melon, beaten a neck by Buveur D'Air a year ago but below par in four starts this season, is fitted with cheekpieces for the first time. Like Laurina, Espoir D’Allen has a sense of the unknown about him. Beaten just once over hurdles, he has won all three assignments this season– all Grade 3s– and latterly in his first contest against older horses when seeing off Wicklow Brave at Naas. Trainer Gavin Cromwell said about the five-year-old: "This will be a big step up in class but he's progressive and has been beaten only once in eight races over hurdles. “He's talented and it was decided to let him take his chance after he worked well at Navan the weekend before last. He's capable of running very well." Ben Pauling thinks Global Citizen will be "electric" when he goes over fences next season, but believes he could easily outperform his odds on his first experience of not just the festival, but Cheltenham. The winner of Newbury’s Gerry Feilden Hurdle in December, he won a Haydock Grade 2 on his latest start but could finish only fourth when upped into top company in the Christmas Hurdle. Pauling said: “He was beaten only 12 lengths at Kempton, when everything went wrong for him. I think he's a very lively outsider and he's massively overpriced. Silver Streak was beaten three lengths by Global Citizen at Haydock but has some smart form at Cheltenham this season, having finished runner-up to Brain Power in the International Hurdle and been beaten just a neck in the Greatwood Hurdle. This looks one of the treats of the season with the quicksilver Apple's Jade aiming to exploit the mares' allowance and unseat the dual champion Buveur D'Air. 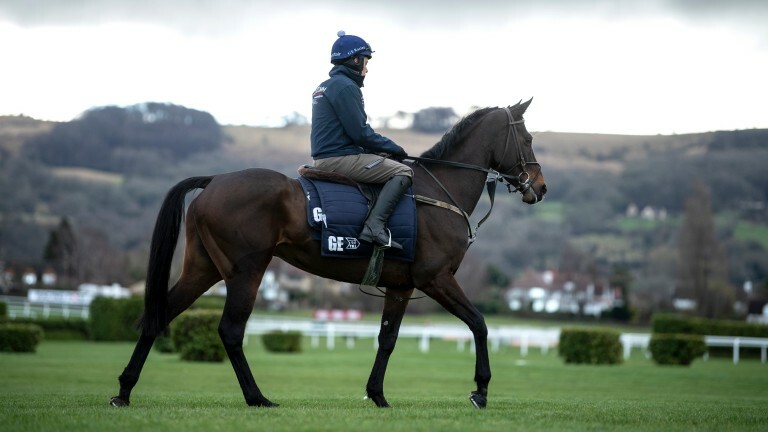 The Irish mare, whose versatility knows no bounds, is probably the best opponent Buveur D'Air has faced yet but if a doubt creeps in it's that so far she has seemed to be at her very best away from Cheltenham. Buveur D'Air has proved desperately hard to beat over the years even when under the weather, as when beating Melon last year, and although the halo seemed to slip a little against stablemate Verdana Blue at Kempton on Boxing Day, today's conditions will suit him so much better. The powerful Laurina has a string of wins in mares' races behind her but this is the moment of truth and she can't afford to lose ground at the hurdles back at 2m. Sharjah is also respected although softened ground and a steep finish might be enough to neutralise his finishing burst. Brain Power can also be considered, while a turnaround from last year's second Melon is not totally impossible despite two lacklustre runs this winter.